We know our customers need cost effective and efficient ways to ship their freight. To provide the best rate without compromising quality or service, Chicago freight broker Skyway Brokerage has partnered with thousands of reliable carriers nationwide to ensure competitive rates and capacity throughout the U.S.
With Skyway Brokerage, in addition to requesting quotes, you can name your own price and we will promptly respond. Partner up with a company that can give you a competitive edge and start using our 3PL services today. We encourage new carriers to become a part of our brokerage network and start connecting with our customers. If you are a carrier looking to optimize your business - you are at the right place. Register today and get in touch with our customers. 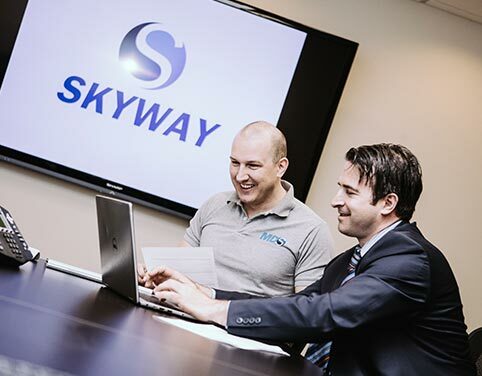 Skyway brokerage is looking to widen its network as much as possible, so if you are a freight broker or an independent agent become a part of our well organized brokerage network. Our PCS Software will reduce costs for your customers by delivering information to them automatically and on schedule. Your carriers will benefit by receiving high quality information, electronic document transfer capabilities and electronic payments. With PCS software, the entire dispatching process is managed electronically, through the software, without the need for additional phone calls, faxes and emails. When you choose our software to manage your operations, you are creating revenue possibilities resulting from your new capabilities and you are reducing costs for your customers, carriers and for your own operations. Our software broadcasts freight offers to approved carriers, checks FMCSA data when they request the freight and then forwards Confirmations, delivery instructions and maps to the carrier you select. Once dispatched, the carrier can stay connected to your dispatch office electronically, keeping you apprised of their delivery status. Once the delivery is made, the carrier can submit delivery documents electronically back to you along with their invoice, which you can then pay electronically. The entire process is completely electronic, FMCSA verified, and practically automatic.